In the crowded market for alphabet/animal apps, you would think that it is impossible to add another app in one's arsenal. Yet, here we are with another app that we believe is worth trying out. Alphabet Animals: A Slide-and-Peek Adventure is a unique alphabet app adapted from a pull tab book of the same name. Alphabet Animals: A Slide-and-Peek Adventure is a new alphabet/animal app with a unique twist. Based on a children’s book by Suse MacDonald, the app has animals posing as letters instead of simply standing next to it. Granted, some poses look rather unnatural, but it is always interesting to see the animals depicted differently. Similar to the physical book, you can pull the card behind each animal with a swipe to reveal the letter it associates with. You can also tap on the illustration to hear the animal name, and the card to hear the letter name. A detail that we enjoyed is the nice animation as you slide the card in and out. The animal will slowly shift its pose, which is a nice touch to keep juniors interested in the app. The app showcases animals that pose to resemble the letters they associate with. Using Alphabet Animals: A Slide-and-Peek Adventure is simple: to move between pages, simply swipe left or right. You also jump from one letter to another by selecting the one from the letter sequence at the bottom of the screen. When you select a letter directly, the app cleverly turns the pages forward or backward to arrive exactly on the letter that you want. Because the screen estate is limited, you may need to drag the letter sequence to the left or right to see the other letters in the alphabet. An added feature in the app is an activity game where you can spell out your name by dragging the letters from the palette at the bottom of the screen. Once you have completed your name, or any other word you wish to write, you can replace the letters with animal pictures. This will result in a unique sequence of animal poses, which you can send via email or save to Camera Roll. The app introduces animals that are not commonly found in other apps, like Xenops. Alphabet Animals: A Slide-and-Peek Adventure is suitable for juniors ages one to two. Besides learning about letters and animals, juniors can learn to be creative in expressing their minds. My three-year-old son Philip and I have used various materials in the past to form letters and numbers, but playing with the app shows us a new and creative way to learn the alphabet. It's really amusing to see the animals in unique poses to resemble the desired letters. I particularly like the poses for Alligator, Elephant, Goose, and Tiger. Finally, I appreciate that Alphabet Animals includes several animals we don't commonly see in other apps, like Parrot, Rooster, Orangutan and Xenops. As a parent, I am happy because this provides my sons with new things to learn. A fun activity lets you spell out your names using animal pictures. Alphabet Animals: A Slide-and-Peek Adventure is a unique iPad app for juniors who are just learning the letters of the alphabet and animals. The developers have successfully adapted the physical book for the iPad and added an innovative activity to inspire juniors to be more creative. Note: Thanks to Auryn Inc. for sharing a promo code with us. My one-year-old son, Noah, loves to play peek-a-boo with the app. Wee Alphas. 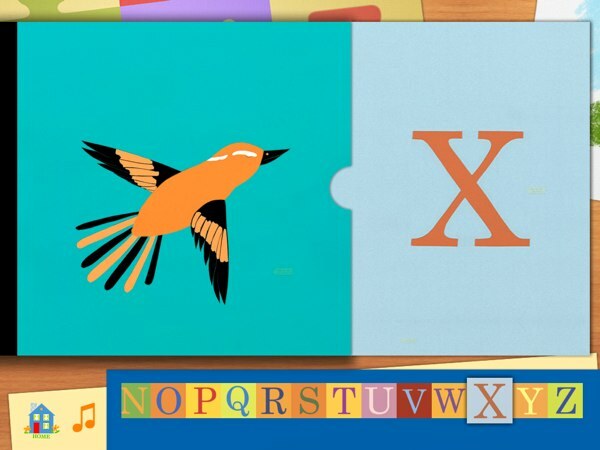 Stylish alphabet/animal app urges juniors to seek hidden letters. Goodnight ABC. 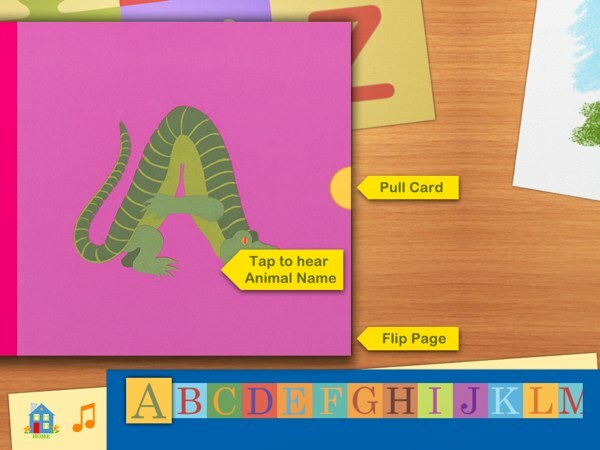 Alphabet app ushers kids to bed with interactive illustrations. Fish School HD. Adorable app helps kids learn their ABCs with the help of colorful fishes.